The workstation concept has always been an attractive one: everything you need to accomplish a particular job housed in one package. In the field of music technology, workstations started with the integration of keyboard, sequencing and synthesis facilities. The idea has grown to encompass storage, more and more effects, and eventually audio recording of some form, whether as linear tracks or by means of sampling options. But a number of questions often occur to the more thoughtful workstation synth user: wouldn't it be nice if we could swap around different bits of various manufacturers' technology to customise our workstation? What if we could add plug-ins to our main instrument? And wouldn't it be great if we could run our favourite sequencer on our workstation? Maverick US developer Open Labs have finally provided an answer to these questions in the form of the Open Synth Neko 64, which builds a PC into a keyboard-equipped package and is therefore capable of running audio-sequencing software, virtual instruments and plug-in effects within the one case. The Neko has been a couple of years coming, and was given a long introduction back in the February 2003 SOS NAMM show report, but it's finally here. And it's deep — a keyboard workstation with an entire PC inside its case, including audio and MIDI hardware and a host of music-making software. Everything can be done in one integrated environment: MIDI sequencing, audio recording, editing and mixing, and mastering to CD. At home in the studio or on stage, Neko can be taken anywhere you'd take an ordinary synth, except it's more powerful and expandable — oh, and larger and heavier, of course! You're also free to add the commercial software of your choice to the supplied collection. It may not be possible to assemble a 'best of' from various Korg, Roland and Yamaha synths with Neko, but given that practically everything in synthesis and sampling history has now been emulated in some form in software, you should be able to easily assemble an instrument that does what you want, in your way. That's the theory, anyway. What about in practice? In an ideal world, I wouldn't have Internet access and music applications on the same computer, but like most of you, that's exactly what I do have! It's often easier, if not necessarily advisable, to have your machine set up like this so that authorisation and updating can be undertaken more quickly. So what about Neko? It can be connected to the Internet, though it does not have a built-in modem. You can add one, though; you could set up a dial-up connection via a USB modem connected to one of the USB ports, or you could arrange a Broadband connection via a cable modem attached to Neko's Ethernet port. Of course, if you have another computer (or a network of computers), then the Ethernet port will allow you to interface with other computers, and it should be straightforward to set up Neko to share any networked Internet access. Most people's first impression of the Open Synth will be related to its size and weight. Once out of the box, many will marvel at the number of built-in controllers, and the huge central display — a massive 15-inch LCD which we'll return to shortly, for good reason. Bemusement might arise when out of the box also falls an Open Labs T-shirt and baseball cap — there's no doubt that this is an American product! — plus a certificate of authenticity for the first 1000 units produced. Quite how, or why, anyone would pirate Neko, though, I don't know! Once you've placed the workstation on a sturdy keyboard stand or table, you may wish to power up. This is a two-stage affair, involving engaging the power supply at the rear, and then pressing a red power button located in a recess below the right end cheek (see photo, right). The instrument will boot immediately, since all the software is pre-installed. The boot process is also nearly as fast as a modern synth powering up. The next big impression will be of fan noise — I really would have thought some form of silent cooling option would have been specified for a product that has the potential to be the only hardware in a recording situation. Open Labs' specs quote 'whisper-quiet' cooling fans, but it doesn't sound like it. There are up to three fans on board, and the decibels mount up. When it's been running a while, you'll also discover that Neko is rather efficient heat source. I'll return to both these points, but a couple of things will stand out when you first boot up Neko. First of all, you'll discover that the colour screen is actually a touchscreen LCD — no mouse is required! And you'll also notice that the working environment, although PC-based, is not Windows XP. Open Labs have helped Neko feel less like a computer by implementing a shell GUI — called, handily, Open Labs Shell — which provides users with a focused environment with none of the normal PC distractions. Neko is, to all intents and purposes, a stand-alone synth, and you don't have to interact with Windows XP at all if you'd rather not. Physically, the Open Synth is one of the most sturdy keyboards you're likely to encounter (see the photos here, on the next page, and on the last page of this review). It's also one of the largest, with the deep, sloping front panel needed to accommodate that amazing display, three controller panels and a laptop-style QWERTY keyboard. 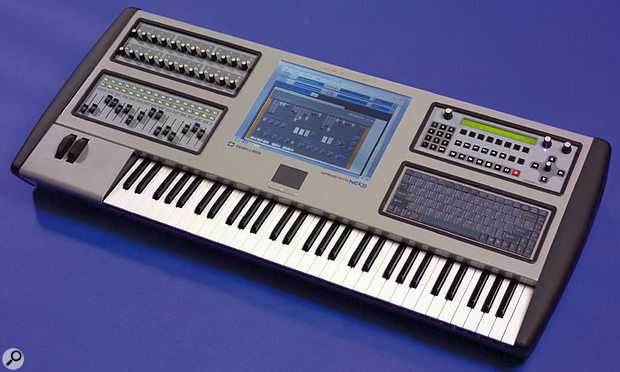 Yes, just like classic high-end audio hardware such as the Synclavier and Fairlight, the Open Synth's main music keyboard is joined by a standard computer keyboard. It was rather a strange experience to be writing part of this review on the instrument I was reviewing! That touchscreen LCD means that a mouse is largely not necessary, but a trackpad with a pair of buttons means that you have a choice if the LCD access doesn't work for you for some specific function. The pad is located under the display. Neko 64 is available in various forms at different prices (see the 'Pricing' box at the end of this review for more details). The model under review features a standard 61-note synth-action keyboard, which feels nice to play, with a traditional light synth action, and offers velocity and aftertouch sensitivity. This is joined by a pair of good-sized rubbery pitch-bend and modulation wheels — the mod wheel is free-running, while the pitch-bend is firmly sprung, with a definite centre detent. The rest of the front panel is arranged as three panels, dedicated to Neko's excellent array of control hardware. Open Labs have these panels built to their specification by a specialist manufacturer. 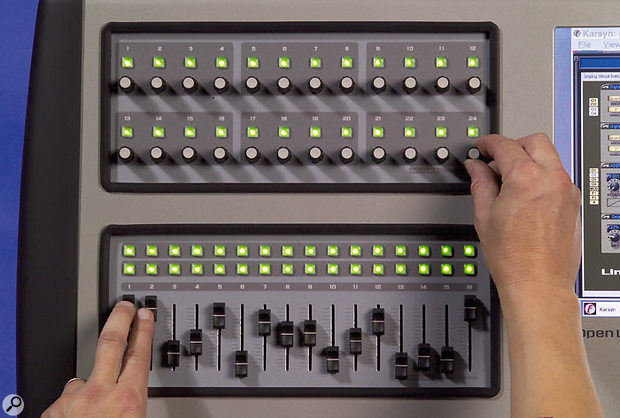 Top left, there's the rotary control panel, offering 24 rotary encoders — they have continuous action, with no end stops — and 24 backlit switches. All are capable of generating MIDI data. Below that is the linear control panel, featuring 16 50cm faders and two rows of 16 backlit switches. One row toggles a value while the other offers a momentary action — they're 'on' only while you press them. Again, all the controls are fully MIDI assignable. Obviously, the rotary panel will figure heavily when it comes to synth editing, and the linear panel will serve most of its life as a mixer controller, but you can customise the controls to do whatever is required. The final module is the master control panel, top right (shown on the next page). Here, you'll find full sequencer transport controls, a numeric keypad, a handful of buttons that access menus in the shell program, a global volume control and a global tempo control. The latter doesn't work with all software yet, but will in future. In addition, this panel offers a 2x40-character LED display with a row of eight soft keys below it. These controls work with the novel alpha stick to provide access to most of the installed software without you having to even touch the screen (this is useful because some Neko variants don't have the touchscreen). The alpha stick, by the way, is an excellent combination joystick/knob/switch that functions in a really intuitive way; it can be customised to do almost anything, since it's capable of generating MIDI data and/or standard key strokes. The cursor buttons around the stick in a cross formation offer even more scrolling and parameter-access options. Note that these control panels are removeable and interchangeable: if Open Labs produce something better or more suitable to your situation in future, you can simply swap the modules. 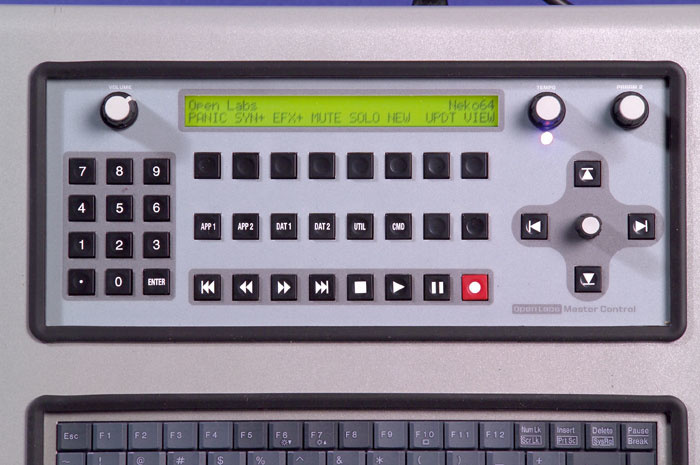 Open Labs have saved themselves a lot of trouble by not developing custom audio hardware. Instead, they've taken the sensible step of adapting an M Audio 1010LT audio card. This card, which can record at up to a sample rate of 96kHz, offers more and better interfacing than the majority of standard synth workstations. It's equipped with no less than two balanced XLR input connectors, eight unbalanced input quarter-inch jack sockets, eight unbalanced quarter-inch jack outputs and a pair of XLR output sockets. Digital interfacing may not seem as well developed, with just an S/PDIF input/output pair of phono sockets, but these are joined by word clock In and Out connections — seriously useful for serious studio work. MIDI connectivity is also inherited from M Audio's card: one In, a Thru and two Outs. These are joined by expression- and sustain-pedal sockets. There is a headphone socket, and it's mounted round the front, just below the pitch-bend and mod wheels. A volume control is joined here, rather incongruously, by a pair of USB 1.1 connectors. These are perfect for adding dongles, compact memory devices, or a mouse. But that's not all the USB connectivity: round the back, there's a pair of USB 2.0 connectors. It's great to see this new high-speed standard being specified. Also in this vicinity, there's a pair of Firewire connectors, a Gigabit Ethernet socket, and a PS2 connector, for compatible mice and keyboards. The Neko family is based around AMD Opteron processors; these are server-quality high-performance processors, with a 64-bit architecture (hence Neko 64). Speeds range from a single 1.4GHz-equipped model to a dual-processor 2GHz configuration. The standard price list teams this processor up with 512MB of RAM, an 80GB hard drive and a CD-RW. A DVD-RW is available as an option, and there is space inside for further hard drives. Of course there are slots for adding more RAM (the Opteron can address up to 4GB in total), and extra PCI slots mean that you can add additional hardware if required. 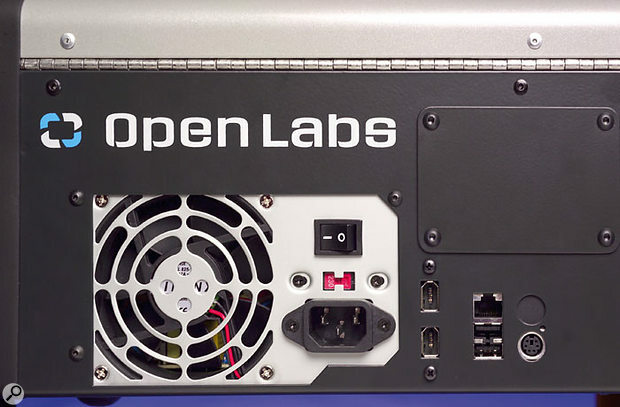 Before we get to the installed music and audio software, there's one package that we must discuss: Open Labs Shell. As you might guess, this application sits on top of Windows XP and aims to keep the workings of Microsoft's OS out of view from those who would rather not know about it. The shell allows applications to be launched and used, files to be saved, and settings made more or less as if Open Synth were a traditional synth workstation. Because it is essentially a computer, though, there will be functions and features that are unavoidably computer-like, though they have largely been made as easy to access as possible. And don't underestimate the influence of the touchscreen: it makes the shell — and even Windows XP — feel very accessible indeed. The first thing you'll see when you boot Neko is a blank screen, with a little 'Open' button to the lower left. Touch this, and a little menu pops up with two buttons labelled App1 and App2. Touching either of these causes sub-menus to appear, consisting of one or more applications. It's here that you launch the tools that help you make music. You're free to add applications to this menu at any time. The Dat 1 and Dat 2 buttons help you get to the hard-drive locations where files are stored by Neko's on-board applications. The remaining main menu items access various utility items, a file navigator, the soundcard control panel, and so on. Pressing Command and then Exit even takes you to the scary world of Windows XP! It's fully possible to operate Neko from Windows, but should you rather return to the shell, there's a short cut on the desktop that takes you back. So what are the main applications supplied with Neko? There are three: Karsyn, Tracktion and Orion Pro. Karsyn is an interesting choice; it's actually a custom version of Brainspawn's forte application, and essentially lets you configure VST effect and instrument plug-ins in pretty much any way you like. In Neko's universe, it turns what is a computer loaded with software into a performance instrument with all the flexibility, if not more, of a 'real' hardware synth. The low-latency virtual rack environment offered by Karsyn lets you treat your virtual instruments as if they were a rack full of standard hardware. It's your choice how they're linked, both in terms of MIDI and audio routing. Key and velocity ranges, MIDI channels, controller mapping and more are all under your control. It's a very flexible system. This application alone may well suit many gigging Neko users — in fact, that's pretty much why forte was developed in the first place. Tracktion will be known to many of you as the Mackie-branded software brainchild of Julian Storer, and finding it at the heart of Neko was a pleasant surprise. It's a brilliant musical environment that's amazingly affordable even when you have to pay for it, and it offers a different way to work with MIDI, audio and loops, but one that is musical and intuitive. It's also a great host for VST instruments and effects, leaving it pretty much up to you how they link together. It's pretty capable as an audio recorder and editor, too, taking full advantage of the audio I/O offered by the Neko package. Tracktion can even host Rewire-compatible applications. Synapse Audio's Orion Pro will also be known to many of you — it was last reviewed in SOS in July 2003. It's essentially a virtual studio aimed mainly at dance music producers. A great selection of tools is provided, and it was interesting, as a long-term user of Propellerhead Reason, to see somebody else's approach to creating a similar environment. In common with most such software, Orion Pro offers a family of sound-making devices and ways in which to sequence with them. Wavetable, FM and analogue synths are modelled, drum machines are provided, and there's even a capable sampler on board. Effects are built in, but any VST effects — such as those installed on Neko by default — are also accessible by the software. Likewise, VST instruments can also be used alongside those built into Orion Pro. I've established that Neko has a healthy handful of host software in which to load VST instruments and effects, so what have Open Labs supplied? There's a comprehensive sampling of the freeware and shareware scene, plus a couple of commercial extras. The latter includes IK Multimedia's Sampletank, Linplug's Cronox, RMIII and Delta III, and a suite of Spin Audio effects. The selection is varied and dizzying — a full list is available at www.openlabs.com/support/support_3rdparty.htm. Old favourites such as MDA's ePiano, JX10 and DX10 are joined by more recent efforts such as the excellent RGC Audio Triangle II synth. I immediately got myself a copy of the latter for my own PC! Also new to me were Buzzroom's efforts: Lallapalooza Lite and BB303i are worthy additions to anyone's sonic arsenal. Green Oak's class freebie Crystal is also there, along with Audio Nerdz's eccentric Delay Lama (which really benefits from being played via the touchscreen...). In short, a varied range of straight synthesis tools are provided, and some of the free/shareware offered here rivals or beats commercial offerings. Sampletank comes with a range of standard imitative sounds, so if you need a piano or some way to mimic 'real' instruments, head here first. For anything more sophisticated, you'll have to add extra plug-ins (or extra sound sets for Sampletank). Effects are not neglected, and MDA are once again well represented, which is great; their established VST plug-ins are efficiently programmed and can produce excellent results. A healthy selection is provided by Spin Audio, and Big Tick, Buzz Room and Kjaerhus Audio are also represented. Between them, you'll have enough delays, reverbs, compressors and standard and non-standard effects with which to sweeten or mess up your audio. While I wouldn't say don't go out and buy more plug-ins or install commercial software, it's true to say that you'll find everything you need to make music already on board. But of course, though Open Labs try to keep the computer in the keyboard hidden, it has all the expandability and software open-endedness of a computer. So while you may prefer working in the shell environment, don't forget that any Windows-compatible software can be installed at a later date and accessed from within that shell. Anyone with an existing suite of software making the move to some flavour of Neko will most probably want to load it onto the new instrument. I was very interested to get Propellerhead's Reason on board, because it's one of my favourite packages and because the idea of Reason being the sonic heart of a synth workstation is really appealing. It worked just fine, as expected. Once loaded, all the available MIDI sources — the main keyboard as well as the separate controller panels — could be assigned to either the basic or advanced MIDI settings in Reason 's Preferences. And even without any fine-tuning, latency of 6ms was available, and that's practically inaudible. Neko then became a hardware Reason synth! Moving around the program with a touchscreen was great. One surprise was that the Master Controller panel also had some good input, with the joystick making it easy to scroll around the rack, and other controls providing instant access to the rear panel and other bits and pieces. There was no messing about with audio, either: I just selected the Neko's 1010LT output hardware, and off I went. The ready-installed Tracktion MIDI + Audio sequencer is Rewire-compatible, and as soon as Reason was installed, it became available from within Tracktion — without a restart. 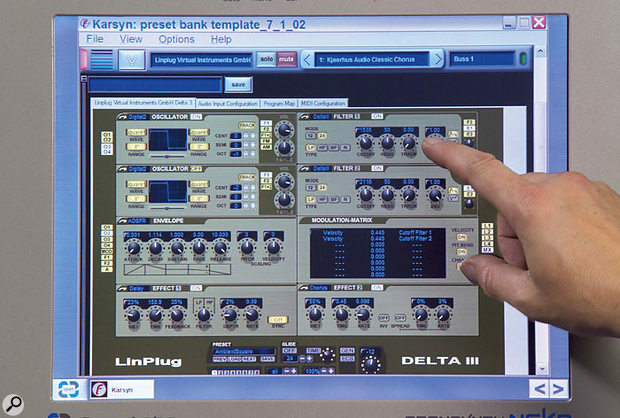 I don't know about you, but this is the kind of pain-free computer-based music setup I want! I had a go at using Cakewalk Sonar, too, again without a hitch. There's a handy step during Sonar 's installation that lets you have Cakewalk's VST Adaptor widget find all the VST plug-ins on your system and make them available to Sonar, which was useful. And all the Neko's audio I/O hardware was recognised during Sonar 's installation. As with Reason, there was a sense that the Neko was taking on the personality of Sonar, since the hardware feels much more closely integrated than in a normal computer-based situation. In fact, the only problem was that I resented ever having to go back to the non-touch-sensitive screen on my usual studio computers afterwards! I have a similar experience when moving from my trusty Korg Trinity to other MIDI devices with large displays: I want to touch a display and get instant feedback. This was one aspect of Neko that I wasn't able to test, due to the access panel being so tightly in place that I ruined several Allen keys attempting to gain entry! However, the upshot is that there are full-size PCI slots spare under the top panel, along with space for additional RAM (as mentioned elsewhere, Opteron processors can address up to 4GB each, if you can afford the memory). The potential is there for you to upgrade the processor in the future, and everything else is as accessible as it is in a PC — maybe more so, actually, due to the hinged access panel and all that space in the Neko's case. In use, there's not much to be said: the Neko works! The shell effectively keeps the worst bits of Windows at bay, and the whole package settles onto your keyboard stand as if it were a standard synth. One could almost review Neko 64 as if it were a synth, but that would be missing the true expandability of the system. It's nice that Windows can be accessed if needed, but it's much nicer knowing that this doesn't ever have to happen if you don't want it to. Of course, you won't be completely immune from computer functions, since this is a computer. But then what is every other digital synth but a specialised computer? What's good about the shell is that anything to do with MIDI or audio drives is ready configured, and placed out of sight. Of course, everything is accessible if you want to tweak settings, but doing so from within the shell is less daunting, especially for the computerphobic, than it would normally be. Adjusting such settings is only marginally more complicated than doing the same job in a global edit page on an ordinary synth. Accessing MIDI ports and audio ins and outs will definitely be more complicated, but as everything in the relevant menus is reasonably clearly labelled, this should not be a problem for most of us. 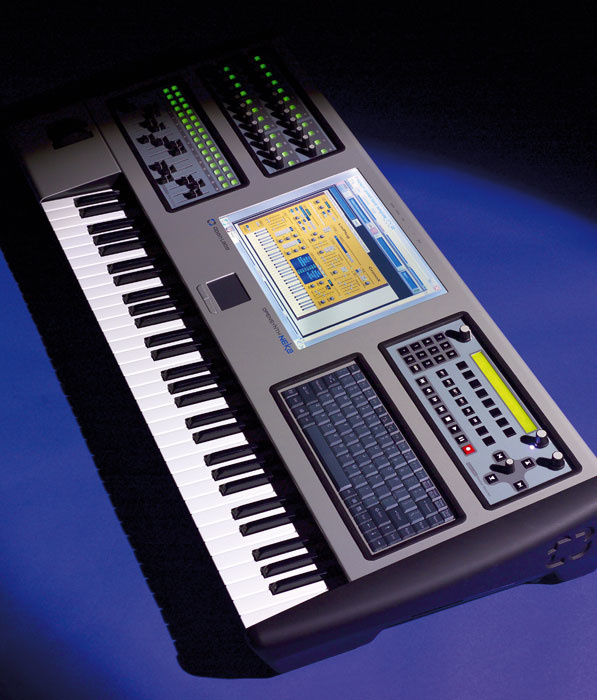 Note that the keyboard and the rotary and linear control panels appear as different MIDI sources, as does the MIDI In on the back of the synth. Likewise, any audio I/O menus will offer a choice of Neko's 10 ins and 10 outs. Of course, the applications that run in the shell have all their standard computer-like functions, so you'll be accessing file saving and retrieval and any other standard software-specific functions via a menu bar. Again, in the context of the shell, and with the help of the touchscreen, the system manages to feel more like a slightly complex synth than a computer. The most important aspect of this integration of hardware, shell and software is probably that great intangible, 'playability'. This brings us immediately to the issue of latency — the delay in any computer-based music system between playing a note and hearing it on a synth, or between making a noise in front of a mic attached to the audio hardware and hearing it though the synth's output. The good news is that it's negligible; I've played hardware workstations that have had a more sluggish feel than this. Neko might be a computer at heart, but this, at least, is a non-issue. The choice of processor and motherboard architecture, together with optimised audio and MIDI hardware and drivers, keep latency at an absolute minimum. Even adding your own software doesn't unbalance the situation; the MIDI sources become instantly available to any new software, and if you need to play with audio settings, the 1010LT output card has its own easily accessible control panel available from within the shell software. Adjust latency settings in any newly installed software to the lowest possible figure, and you probably won't become unstuck. When I installed Sonar, I went immediately to a latency of around 5ms with no CPU issues or playback problems. That eminently more-than-acceptable figure was achieved without even trying hard — better might be achievable. What about comparing other workstation synth specs, such as polyphony, multitimbrality and so on? Well, Open Labs' own documentation quotes 128-note polyphony, but it's hard to see a real limit. Sequencer tracks number a maximum of 128, although internally, that number would depend on the sequencing software you were running — it could be effectively unlimited, of course. Effects processing is also practically unlimited; you're free to assign whichever and as many effects as you like, or your chosen host software will allow. Being a cutting-edge PC, Neko can accommodate a lot of RAM — up to 8GB on the top-rung dual-processor models — and there's space for multiple hard drives in the case. Any format of audio file acceptable to Windows XP can be imported, and in terms of controls, Neko beats much of the competition with its 24 rotary encoders, 16 faders, and multitudinous buttons, to say nothing of its comprehensive controller module. As a studio tool, Neko 64 does suffer from one problem. Because everything is in the one package, any audio recordings you make with it will have to be in quite close proximity to the synth unless you invest in some very long leads or make up some stage boxes to extend the audio hardware. And recordings made in the same room do capture the fan noise. I'd like to see this aspect addressed in some way — surely there must be quieter fans! One-room home studios may not be the first place you'll see the fruits of Neko's labours, though, unless the owner of that room has a fair bit of spare cash. But if it is in your price bracket, synthesis, sequencing and audio recording doesn't get tidier or more integrated than this. I'm sure linear audio recording will be de rigeur amongst synth workstations in the near future, but any standard workstation synth so-equipped will still not be as readily expandable as the PC-based Neko. Another place you'd see a workstation synth more frequently than a computer would be on stage, but I'd feel quite happy taking a Neko out live (its weight would require both a flightcase and a stand that could handle the pressure, though). As a performance computer, it's unique. The top-of-the-range model has a built-in uninterruptible power supply, and it boots up quickly, making recovery from power cuts less of a strain than on a standard computer. I certainly wouldn't be surprised to see Nekos on stage during big-name tours in the future. There's no doubt that Open Synth is an exciting concept. Even software that you're familiar with takes on a new life when it's actually integrated into your keyboard. The only downside has to be the price. A suitable laptop PC from a major computer chain could be had for well under £1500, a quality USB-equipped master keyboard needn't cost more than £400 (and that's for M-Audio's new weighted Keystation Pro 88), basic audio hardware doesn't have to cost more than £100, and as for software... the same shareware and freeware packages available here can be purchased on-line by anybody. Those are just rough figures; it could be done more cheaply or more expensively and still beat Neko on price. But what you couldn't buy is the integration, the hiding of the computer from the user, and the way in which irritating underlying issues such as audio and MIDI drivers are taken care of in an elegant manner. You also wouldn't be buying the road-proof case, which I personally find rather elegant. Attempting to lug its bulk around without help might take the shine off that impression, though! Currently, Neko 64 is perhaps unique, though there is a small range of devices coming on stream that aim to provide hardware playback of VST plug-ins — Muse Research's Receptor and Manifold Labs' Plugzilla come to mind. Whether there are developers waiting in the wings to see if Open Labs succeed before entering the market with similar keyboard-based products remains to be seen. But anyone attacking Neko 64 on its own terms will have to work very hard, because Open Labs have done an amazing job. Neko is available in a number of configurations, and there is a certain amount of user choice: 76-note keyboards, uninterruptible power supplies, and of course those user-configurable front panels, for example. The result is a potentially complicated pricing structure. Here, though, is the basic outline of the range. An additional complication is that there is no UK distributor at present, which means that potential UK customers are responsible for paying the not-inconsiderable shipping costs from the USA (these instruments are heavy) and also the customs and excise duty. Neither of these costs is included in the prices quoted here, and you should bear this in mind when budgeting for a Neko. These are Open Labs' suggested US retail prices, with approximate sterling equivalents afterwards in brackets (correct at time of going to press in mid-November 2004). Neko 64 with a single Opteron 64-bit 1.4GHz processor, 512MB of RAM, an 80GB hard drive, CD-RW, software bundle and touchscreen: US $5495 (£2970). Neko 64 with dual Opteron 64-bit 1.4GHz processing, 512MB of RAM, an 80GB hard drive, CD-RW, software bundle and touchscreen: US $6000 (£3240). Neko 64 with dual Opteron 64-bit 2GHz processing, 512MB of RAM, an 80GB hard drive, CD-RW, software bundle and touchscreen: US $8600 (£4650). Just as I was finishing this review, Open Labs released news of the Open Synth Neko LE, which retails for US $2600, or US $3200 with optional LCD monitor (that's currently about £1400 and £1730 respectively). The concept is the same, complete with ready-loaded software bundle, but the control panels are now optional add-ons, the processor is a Pentium 4, and you can supply your own external monitor. That said, the LE can be upgraded to a top-of-the-range Neko at any time. It really is a PC built into a keyboard! Great choice of audio hardware. Built-in CD or DVD burning. Supplied software suite offers everything you need to make music. Range, on the whole, expensive. Some way of labelling encoders and faders would have been nice. No UK distribution at present, so the UK customer is currently lumbered with customs duty and shipping charges from the USA. A real first, the Open Synth Neko 64 not only proves that the 'PC in a keyboard' concept can fly, but does so in an elegant and easy-to-use form. 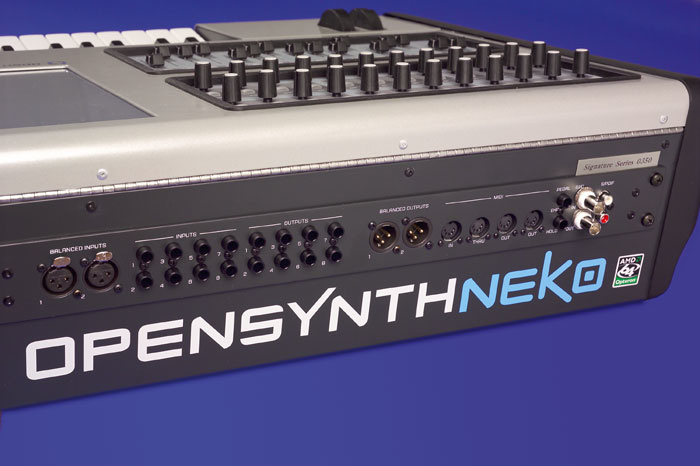 The current high prices are something of a shame, but let's hope that the new, more affordable Open Synth Neko LE points the way forward. See the 'Pricing' box for details. Open Labs +1 512 444 6222.